The RG-11 is a novel, futuristic and relatively inexpensive optical rain sensor, pictured right. This sensor has particular appeal for hobbyists and experimentalists, including those who need a sensor to trigger some electromechanical action when it starts to rain, as well as for more traditional weather-monitoring applications. 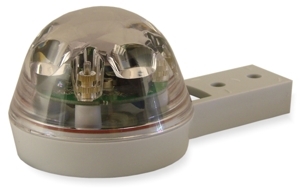 The sensor design consists of a clear hemispherical dome – about 7cm (2.75 inches) in diameter and with the whole assembly about 12cm (4.5″) long, to give some idea of scale – within which a set of four light beams are reflected and constantly monitored. 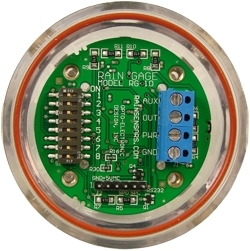 The dome also covers a circular circuit board (see below), both attached to a sturdy grey plastic mounting bracket. When rain or some other cause of water droplets (for example dew or condensation) start to form on the outside of the dome, the beam reflection pattern changes in a subtle yet detailed way which can be translated by onboard circuitry and firmware into a carefully-processed output signal. As the water droplets run off or evaporate or are replaced by fresh droplets so the reflection pattern changes and is continuously monitored, with outputs triggered accordingly – see below for a more detailed description. The RG-11 sensor is available to buy from our online shop or contact us for further information. All RG-11 sensors we ship will have the latest SW011 firmware and RainX treatment. There may well be other applications for which the RG-11 sensor is suitable; the RG-11 is a new product for us and we have almost certainly not yet identified all potential applications – please let us know if you have some further novel ideas for using this device. We will also be conducting some trials of rainfall measurement accuracy – more information will be posted here when preliminary results are to hand, most probably during Spring 2012. Mode 0 – Tipping Bucket Rain Gauge Mode: Tipping increments of 0.2, 0.01 and even 0.001mm – and inch equivalents – are all possible! A PDF copy of the instruction manual for the RG-11 rain sensor can be downloaded here. A small US-based section of the main WXforum website has recently been established specifically to discuss the RG-11 sensor. This forum may be viewed at: www.wxforum.net/index.php?board=108.0.